My Ball of Wax: What’s Yarn Got To Do With It? What’s Yarn Got To Do With It? Years ago, I remember watching my friend Rana crochet with both a speed and ease that was nothing short of inspiring (you can see her work here). So, when she offered to teach me, I jumped at the chance to learn. Once I got the hang of it, I began making scarves, mainly because they were quick, easy and I got to use the delicate yarn. I sold them for twenty dollars, which means I wasn’t making any money, but seeing people wearing my velvety soft creations made me happy. Then, of course, life got in the way, and my crocheting days were put on hold…up until recently. In choosing hobbies, I naturally gravitate towards relaxation. Writing, running and reading all give that to me in some form. I just remembered that crocheting used to give me that same type of tranquility, so I decided to come out of retirement. About a month ago, I went on my first “back in the game” yarn shopping spree at Michaels. 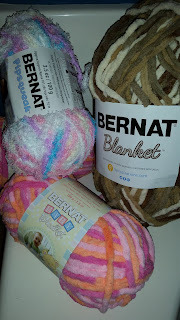 After beelining to the yarn section, I found some old friends there like Red Heart and Caron, but my eyes shifted immediately to a brand I wasn’t familiar with-Bernat. The moment I saw it, I wanted to nuzzle up against it. When yarn looks that cozy from far away, it rarely disappoints when you’re up close and personal. I decided instantly that four brown skeins were coming home with me. There were a few problems I didn’t foresee when I was in the store. The first is that I hadn’t crocheted a blanket in over ten years. Naturally being an ambitious person, I got to work as soon as I got home, and roughly 400 chains later (and maybe a slight death wish), I was on my way to making a king size blanket. 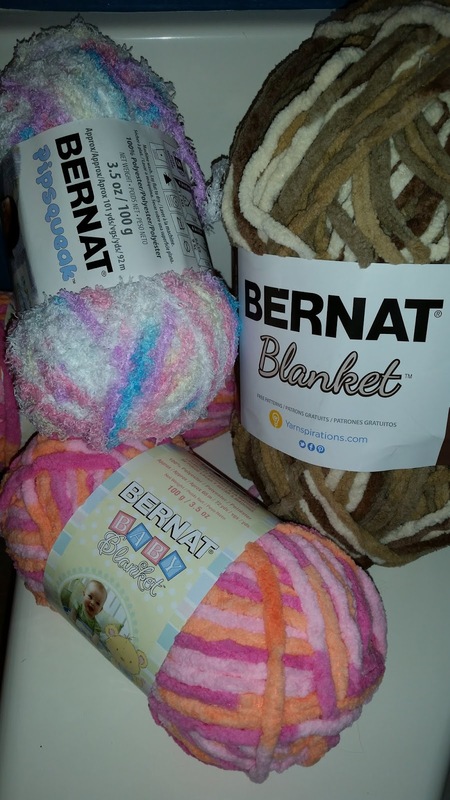 I secretly cross my fingers on a daily basis in the hopes that Michaels will have enough stock of Bernat's Sonoma to see my blanket through to the finish. The plus side to this is that because I am relearning, at least all of the mistakes will be on one blanket, rather than on twenty. Another problem, which may be debatable, is that the “good” yarn is always a bit harder to work with than the less expensive material. Even with a quarter of my insanely large blanket completed, there are still days where I sit cursing at the yarn, blaming its beautiful lushness each time my hook gets snagged. When my frustration roars its ugly head, I consider going back to Michaels for a more novice-friendly yarn. However, I always wind up convincing myself that even if I were the best crocheter in the land, I would still have issues with better quality yarn, so I stick with what I have and press on. In the short amount of time that I’ve been back at it, I’ve learned that whether it’s the “yarn’s fault” or just the more likely fact that I have a foggy memory when it comes to crocheting, the reality is that I am addicted to pretty yarn. And regardless of how hard it may be for me to work with, I will always surrender to its beauty. *Don’t forget to take a look and place your order for one of Rana’s beautiful personalized blankets here!